Dynamics CRM and Microsoft Dynamics AX? There are a couple of features will be removed from SQL Serve Denali. Please keep in mind that some of your app might be broken due to this, especially for DATABASEPROPERTY and sp_dboption. So you may want to check out this blog post http://blogs.msdn.com/b/qingsongyao/archive/2011/05/18/features-will-be-removed-in-sql-server-denali.aspx. To ease cloud deployments for their combined customer base, Microsoft and SAP are configuring some of their software products to work more easily together. SAP will expose some of the functionality in SAP software to the Microsoft .Net platform as well as the Microsoft Azure cloud computing service. These should speed development of .Net applications that interact with SAP programs, and make it easier to connect Azure cloud applications to internal SAP systems. With the .Net integration, developers will be able to tap SAP’s NetWeaver Gateway connectivity framework without specific knowledge of how to use Gateway. When building applications, developers can use the Gateway to build applications that draw data from the SAP Business Suite applications. The integration technologies will be available as an add-on to future editions of Visual Studio, as well as in modifications to the .Net framework. The partnership will also provide an SDK software development kit to bridge Microsoft’s Windows Azure cloud platform with NetWeaver Gateway. SQL Azure Reporting Services — is complex-event processing. The cloud version of this capability is known as codename “Austin,@ which the service version of the StreamInsight complex-event-processing capabilities that are in SQL Server today. Complex event processing “enables real time insight into vast volumes of streaming data,” which is distinct from, but related to, business intelligence, andenables analytics and insight into a set of existing data to inform future decision making. Austin is g released in private Community Technology Preview (CTP) form and it will be available as a public CTP, available from the SQL Azure Labs Site, in the second half of the year. “Smart grid” management (e.g. infrastructure for managing electric grids and other utilities, such as immediate response to variations in energy to minimize or avoid outages or other disruptions of service). Austin will elp implement complex event processing on-premises and to be able to collect and process events from anywhere and to derive trends from a vastly increased series of events since that data is sent to the cloud. TechEd attendees learned this week of soem planned unspecified SQL Azure releasefor the integration of import and export features in the management portal; and enhancements to the Web-based database manager (a k a, “Project Houston”) for additional schema management, and a new service for managing SQL Azure databases through an Open Data Protocol endpoint. Microsoft made a CTP for a database import/export capability available this week, to allow SQL Azure database users to more simply archive SQL Azure and SQL Server databases, or to migrate on-premises SQL Server databases to SQL Azure, according to company officials. The famer is busy witht his crops and livestock and needs a wife to deal with the planning, administration organisation and finances. The same consideration applies to managing the productionof films, videos and animations. Hotel Show 2011 starts tomorrow. 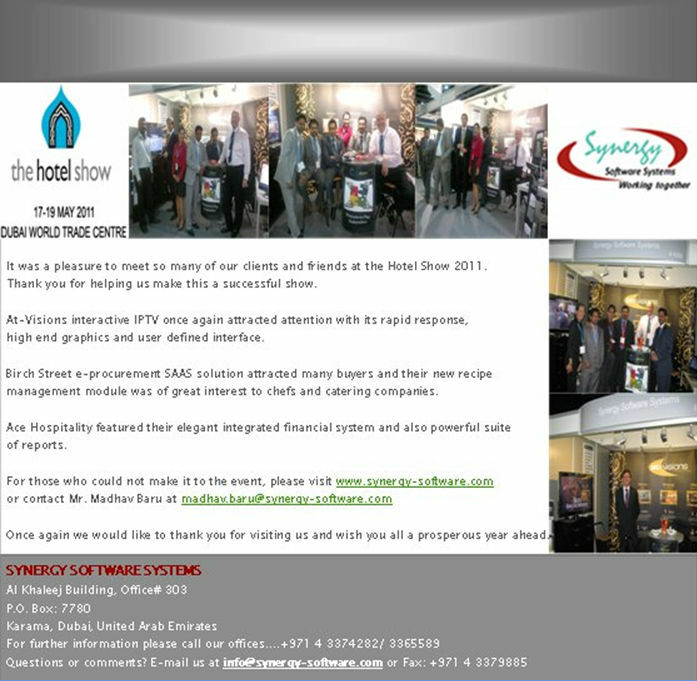 Synergy has implemented software solutions in over 150 prestigious hotels across the region. Our solutions include: Sunsystems Financials, Human Capital Management, Asset Tracking, Birch St e-procurement, One Vision ipTV, Access Control and Time and Attendance and specialist technology soltuions. Come and see our award winning solutions. Microsoft recently released hotfix rollup 7 for Microsoft Dynamics AX 2009 Service Pack 1 This is a roll up of all hotfixes created since RU6, and contains all hotfixes since SP1 . This roll up has a lot of kernel, application and country specific fixes that . If you are in a new implementation, then ensure your partner is taking and working from the RU7. One thing of note, the following link. : Hot Fixes Released For Microsoft Dynamics AX 2009 has not been updated yet to reflect this release. I expect this will be updated soon, as this is the more “formal”, place on PartnerSource / CustomerSource that such information is managed. You need access to CustomerSource or PartnerSource to access RU7. See us at the hotel show where we will demosntrate Birch St a Saas e procuement solution used by over 3000 major hotels. The new recipe management module comes with 1200+ in built and youchefs can add their own regional recipes. If your recipes give measurements in cups and spoonfuls and you need to scale up for a banquet of several hundreds then Birch St will do the conversions for you. It will also provide nutrional analysis and help you with menu engineering. A powerful e procurement workflow is an essential control in any hotel. This has to be available for multiple requesters and approvers within a sensible licence cost. The Saas based module means fast implementation, with no additional hardware, database or operating system costs, no upgrade costs, lower up front investment costs for a new property and less work and worries for IT staff.